printer/encoder is one of the most versatile in the industry! 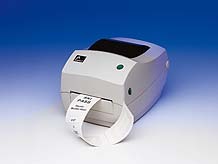 Designed for printing and encoding smart media such as wristbands and smart labels, the R2844-Z meets the needs of applications requiring greater processing speed and more connectivity choices such as standard serial, parallel, and USB ports, and optional Ethernet. It also offers the widest range of supported 13.56 MHz RFID transponders, including Philips’ I-Code ®, Philips’ EPC, TI’s Tag-it ®, Inside Technologies’ PicoTag ®, and ISO 15693 from Philips, Infineon, and Texas Instruments. Transponder sizes can range from 12 x 28 mm to 90 x 130 mm.